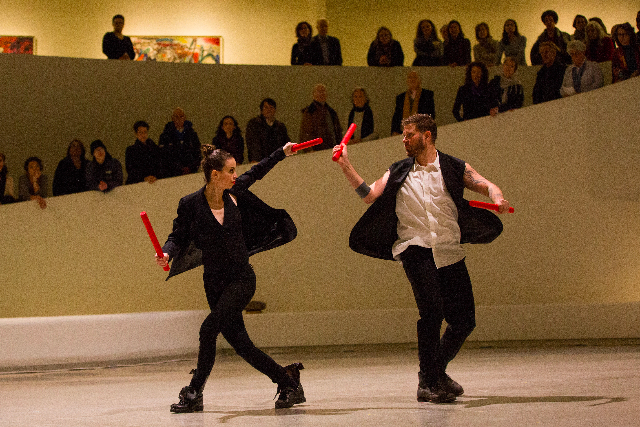 On February 16, Michelle Dorrance and collaborator Nicholas Van Young, accompanied by a large cast of multi-talented dancer-musicians from Dorrance Dance, treated three sold-out audiences to an exhilarating, non-stop celebration of percussion and movement as the inaugural performance in the Guggenheim’s “Works & Process” Rotunda Project. The Rotunda Project is a new Museum initiative for which residencies and performances are commissioned specifically for the rotunda. Dorrance used the museum’s iconic, snail-like spiral to maximum advantage, with dancers zooming in and out of the main rotunda and occasionally popping up among the surprised audience in the tiers above. Not since the queen of modern dance innovation, Meredith Monk, also took over this unique space many years ago, have we seen such a clever, harmonious and technically skilled performance. But then again, one would expect nothing less from Dorrance, who is always a joyous creative “force” from the moment she takes the stage. It was astonishing to realize that it was all over in a mere 30 minutes, given the amazing variety of sound, types of dance including terrific tap dancing of course, but also a lot of modern dance with a bit of hip hop, folk and even acrobatics mixed in). There were interesting and ever-changing set elements that were incorporated to make up the harmonious whole. The dance ranged from intricately choreographed moments that involved the entire dance troupe, to exhilarating tap duets with just Dorrance and Van Young. There was a segment in which Van Young stood solo on stage to wordlessly “conduct” quadrants of the audience in a clapping exercise that was both amusing and beautiful. Every moment of the evening was exciting, unexpected and uplifting – true genius indeed! The next “Works & Process” project will premiere in September 2017, spearheaded by American Ballet Theatre principal Daniil Simkin, with choreography by Alejandro Cerrudo, costume design by Dior, and projection design by Dmitrij Simkin. The dancers movement will be captured in "real time" by infrared motion sensors, enhanced by 3-D mapped visuals. They will be projected onto the surface of the rotunda to create an immersive experience meshing technology, music, visuals, fashion, design and dance. Tickets are $40, with $10 Student Rush Tickets available one hour before each performance. For more information call the Box Office, 212-423-3575 or go online at worksandprocess.org. Leadership support for Works & Process Rotunda Projects is provided by the Mertz-Gilmore Foundation and Caroline M. Sharp; the Michelle Dorrance Rotunda Project was underwritten by Stuart Coleman and Meryl Rosofsky.